Heat oven to 350°F. Place mini paper baking cup in each of 24 mini muffin cups. In a medium bowl, beat cake mix, water, 3 tablespoons oil and the egg with electric mixer on low speed 30 seconds, then on medium speed 2 minutes. Divide batter among muffin cups. Bake 11 to 13 minutes or until toothpick inserted in center comes out clean. Cool 10 minutes; remove from pans to cooling racks. Cool completely. In 3 small microwavable bowls, microwave each color of candy melts separately on Medium (50%) 1 minute, stirring once, until melted. Stir 1 teaspoon oil into each bowl until blended. Dip two-thirds of pointed end of each Bugle snack into orange coating. Place on waxed paper; freeze 5 minutes or until set. Dip pointed tips into white coating; freeze 5 minutes or until set. Dip wide ends into yellow coating. Gently press yellow end of each snack onto center of each sandwich cookie; let stand until set. Tint frosting with food color. In small microwavable bowl, microwave frosting on High 10 to 20 seconds or until thin enough to pour. Frost cupcakes, allowing frosting to drip down sides. 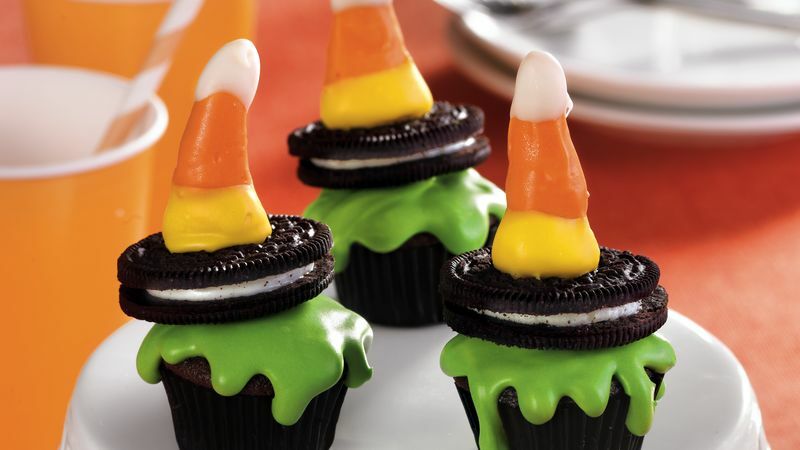 Top each cupcake with witch hat cookie.